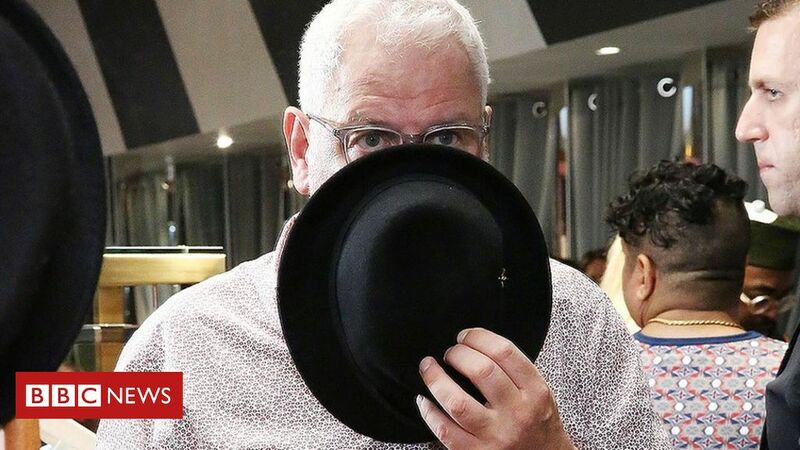 Troubled fashion chain Ted Baker has said it is “determined to learn lessons” from the “forced hugs” scandal that forced out its boss Ray Kelvin. The pledge came in its annual results statement, less than three weeks after Mr Kelvin resigned in the wake of the misconduct allegations. Pre-tax profit for the year to 26 January was down 26% to £50.9m, from £68.8m a year earlier. The figures were in line with a profit warning issued last month. The firm is continuing an investigation into the allegations against Mr Kelvin. Its shares fell more than 5% in early Thursday trading. In its results statement, Ted Baker said it wanted all employees to feel “respected and valued” and would ensure that “appropriate changes” were made. The scandal over Mr Kelvin, who founded the chain and was its chief executive, broke in December, when employees launched an online petition accusing him of inappropriate comments and behaviour. The petition, on the workplace website Organise, said that more than 200 Ted Baker staff were finally breaking their silence after at least “50 recorded incidents of harassment” at the fashion group. Staff claimed that as well as engaging them in unwelcome embraces, the brand’s founder had asked young female members of staff to sit on his knee, cuddle him or let him massage their ears. At the time, Mr Kelvin took a voluntary leave of absence. He stepped down on 4 March. The firm said its investigation was continuing and would now focus on Ted Baker’s “policies, procedures and handling of HR-related complaints”. Acting chief executive Lindsay Page said that “despite difficult trading conditions”, the firm’s sales performance over the year had been “resilient”. The results showed a marked divergence between the fortunes of its online and High Street operations, reflecting current consumer trends. E-commerce sales rose 20.4% to £121.7m, but overall retail sales were just 4.2% higher at £461m. At the same time, retail sales per sq ft of High Street store space decreased by 5.5% to £786. “Performance was impacted by competitive discounting across the retail sector, consumer uncertainty, the well-publicised challenges facing some of our UK trading partners and the unseasonable weather across our global markets at different points throughout the year,” the retailer said. George Salmon, equity analyst at Hargreaves Lansdown, said: “These are turbulent times for Ted. The top line is still heading in the right direction, but only on account of the continued addition of new sales space and the strong contribution from online sales. “However, Ted had already braced investors to expect a drop in profits this year, and sentiment was already frayed on the back of the ongoing investigation into the former CEO’s conduct.